Lost in the Sayashi's sudden graduation announcement, Aarii's 1001 Nights event kind of slipped under the radar. This marked the 24th in this series of talk events, held on 29th October 2015, a scant few hours before Riho dropped the bomb on us. Usual disclaimer applies: these are based on fan reports, noob translator will most likely add even more confusion, translations are generally done from a first person perspective out of own habit. Aarii had been hit by tonsillitis before the event, so this was her second appearance after her diagnosis. (Her first appearance was at the PB release event 3 days before, where she'd apparently just gotten off the drip before appearing). Also, regular chairperson Nishiguchi-san wasn't around, so the event started off with an unnamed member of staff acting as the chair. Q1. What's your point of appeal, something that other members of Juice=Juice don't have? Q2. What did you think when you were told that you would be releasing a photo book? I was happy at first, but I asked for less swimsuits. I'd already told our manager-san that I was really against swimsuits, but it the end, the photo book ended up being 80% swimsuits. Chair: But, the cover's lovely. Q3. If swimsuits weren't required, how long would it take for your second photo book to come out? If swimsuits aren't required, I would be fine with releasing another within a year! Q4. Uemura-san, I feel like you've gotten better at singing. Was there something that raised your awareness of singing? When I compare myself to how I sounded like before on CDs, it's like we're completely different people. I guess it's Sugai-sensei's power. Q5. What's your sales point? What you want people to pay attention to when they watch you? Q6. The origin of the name 'Akari'? I think the meaning comes from something like the cheerful (Akarui) path, on expectations that I'd properly go down that path. My parents gave the name to me, so I actually have no idea. Q7. For the poses in your photo book, did you use your fellow members or any other person as a reference? I received Sayashi-san's photo books, and used them as a reference. Sayashi-san made a lot of poses and expressions. Also, Suzuki Airi-san's make-up book. Using those as references, I planned to do the photo book with everything I had. Q8. If you were to have an overseas concert in the future, where would you like to go? San Francisco! San Francisco is New York, right? Ah, they're at opposite ends. New York is on the opposite side of America from San Francisco, right!? Miyamoto Karin-chan wants to go to New York. In general, America. Q9. If you could become another Hello! member for just a day, who would you want to become? Okai Chisato-san. She's got a large family, so I'd like to experience that, since I'm an only child. She's got younger brothers? Younger sisters? She's got several of them... Well, because she hails from a large family. Q10. 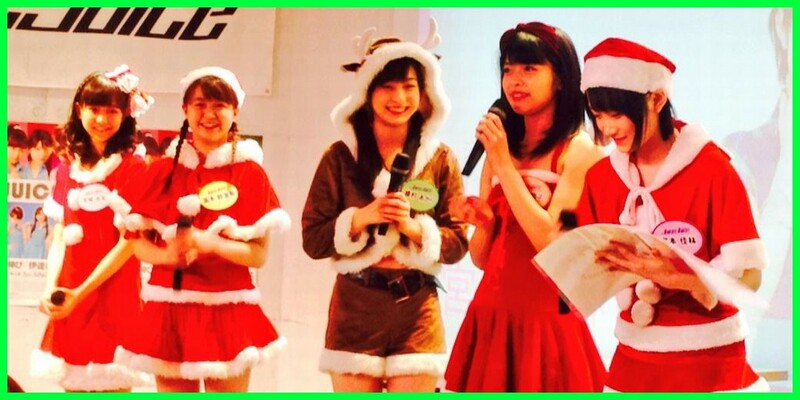 Juice=Juice's catchphrases are 'freshly harvested', 'freshly picked', 'fresh', 'natural', '100%'. Which page in your photo book would you apply those to? The shot where I'm hugging that dear Labrador retriever Go-chan. It was really fluffy. I'd like to raise it, because the only animals I've raised are parrots. Q11. What pet would you raise, if you could raise something besides parrots? I like dogs, so maybe dogs. It'd be a Cavalier cocker spaniel. Q12. How enthusiastic were you about the sale of your photo book? I was opposed to swimsuits. I'd already begged my manager-san to reduce swimsuits, begging on my knees, but I got tricked. Q13. During your time as a Kenshuusei, you grouped together with Oda Sakura-chan and Hamaura Ayano-chan to make 'Ramen Factory'. Please tell us of a story from then. Hamaji likes ramen, so we always went for ramen when we got hungry. Later, Oda Sakura-chan would occasionally join us. We've talked about going for ramen again, but we still haven't done it yet. Chair: What's your favourite type of ramen? Q14. Are you still raising your Malayan banyan, Uekii? It seems that it's good to let it listen to music and sing to it, but have you done anything for it? Once a week is fine, I give it water. I'll put up a photo on my blog later. Q15. Aarii, you've got a nice figure, but is there anyone whose figure you admire? Rola-san. I've heard that she's really serious when it comes to beauty. Since she's done a lot of things, I think that I need to make that kind of effort, but I can't do anything since I have no idea what to do. Q16. What's your best confection or dish? For confections, it would be pancakes. Or things that you can make with powder mix. Like cookies. For dishes, miso soup. And I don't mean instant versions. Also ramen. In this case, I'm talking about instant versions though. The mole on my face. 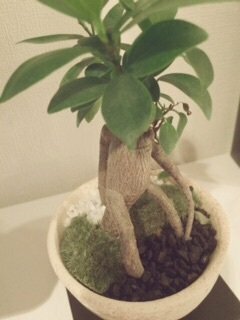 It becomes triangular during winter. Q18. This autumn, did you get interested in anything new? Chair: That thing you're doing, do you mean to say that you look for clothes using your mobile phone? Yes, I look for clothes using my phone. Q19. What do you like most about Yukanya? When she's troubled, she doesn't seem troubled. She's knowledgeable and is careful about beauty. She's like an older sister. Yuka loves her family. Q20. Please tell us the sweets that you recommend the most at convenience stores? Is it fine it it isn't a sweet? Recently, it's been edamame. Also, cucumber snacks. Q21. How do you prefer your fans to join in with your performances? ①, absolutely! I enjoy the feeling of dancing together, and because everyone's memorised the dances, there's a sense of unity! Well, I guess everyone has their own way to enjoy watching our shows, so anything's fine, but ① is my favourite. I enjoy ones that look like normal, daily clothes. If you're talking about 'outfits', I like dresses with flowers attached. Q25. What would you like to do if you turned invisible? That reminds me, on LINE news the other day, there was a report that a small invisibility cloak had been developed. The members of Juice=Juice had a discussion about it. I'd like to try out things that you can't really do, like wandering about at Shibuya 109 in the middle of the night. Ah, I wouldn't shoplift (laughs). Q26. When you become a granny, would you like to live in Tokyo or Osaka:? I once thought that I'd like to return to my parents' home, but Tokyo's good too. It'd be great to stay at both. I'd like to have a holiday home! Q27. Favourite page in your photo book? The one with the Golden Retriever Go-chan. Q28. 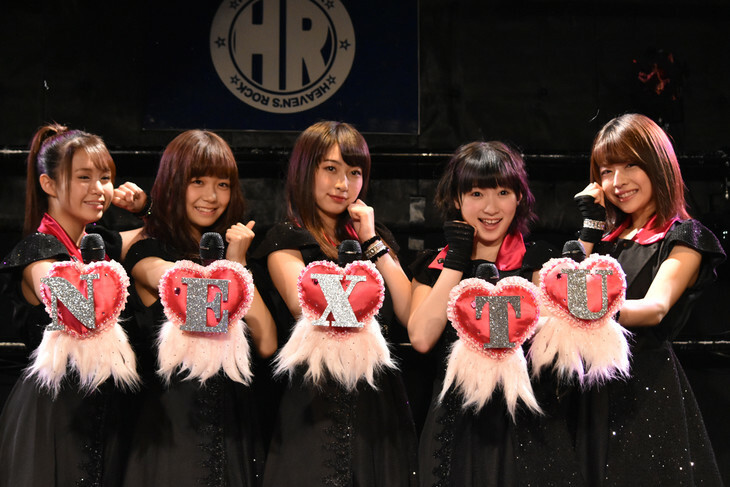 In Juice=Juice, who would you like to have as a lover, and who would you not like to have? I wouldn't want any of them! It'd definitely be a pain! If I had to be with her every day, Tomo. I feel like we'd be able to have non-committal conversations. and that we'd wrap things up quickly. Q29. Kanazawa Tomoko-san's cat 'Nuntun' has made his magazine début. Would you like your parrot 'Happy' to make their magazine début? I'd like it if that could happen. I'd like to bring out Happy at a birthday event. Parrots have good ears, so Happy might hate loud voices though. Also, I want to put clothes on Happy. Chair: Are there clothes for parrots? I don't think so. But I'd like to put a hat on Happy, and put on socks on its claws. Strawberries, Chocolates, Mangoes. Or fruits. Because we often get them as gifts and eat them in our dressing room. Someone asked a similar question just now. I'd like to try raising a Shiba Inu as well, and Labrador retriever puppies too. Q32. What do you do when you're on the move? Q33. If you could bring together a new unit, like Patisserie at HinaFes, who would you like to be grouped with? I'd like to be grouped once again with Iikubo-san and.... and.... How should I move on from here? Q34. Who is the person you respect? Morning Musume。´15's Sayashi Riho-san! Perhaps because of her high professional awareness, she acts magnificently at the centre of huge stages. I know that she's also polishing up her dancing as well, I admire her! Also! Even though Sayashi-san was at the office today, my manager-san didn't tell me, so I didn't see her! Q35. To Uemura-san who's gotten increasingly better at singing after receiving lessons from Sugai-sensei. What do you talk about in post-concert reviews? We talk about how the audience got pumped up, or the normal things that we slipped up on, or how it might have been better to say this or that during talks. Q36. If you've got any recent lovey-dovey stories with Miyazaki-san, please tell us. I haven't seen her recently. I guess that there was that time when we fell asleep together. We slept in an embrace, then while hugging, we went straight to perform. Ah, I didn't mean it in that way. We fell asleep, we woke up, changed outfits, and then we went to perform. Q37. Please do one of those eye-catch statements, like in HaroSute. I'll leave the contents up to you, but if you can't think one up, please go 'I love you'. Nishiguchi: For the people here, they might want to be told off. For example, 'Don't be late'. Nishiguchi: I won't be late again. Q38. What song from another group would you like to sing? Ogata Haruna-chan. We had a shooting together the other day, and she's knowledgeable about maintaining skin fairness. Also Makino Maria-chan, I'd like to look at her freely. Q40. How enthusiastic are you about your drama performance? There's so many things I don't know. I want to completely get into character, but I have no idea how to go about it. I don't know how to memorise the script. I'm playing the role of the centre in the drama, so I'm worried. 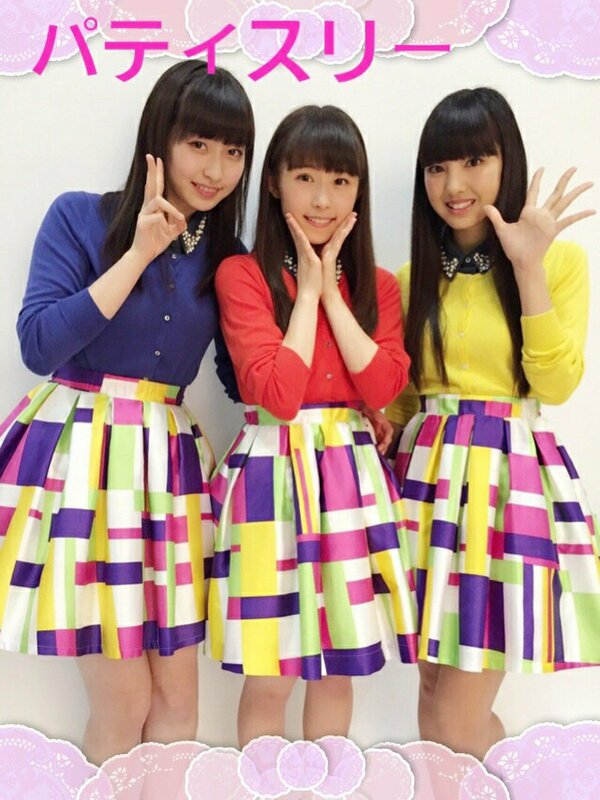 Juice=Juice is a group where Karin-chan is centre, so I don't think that I have the 'centre' image. Nishiguchi: That's not the case, aren't you the cool beauty? Q41. I like Mikitty, so I became interested in Uemura-san, who's recently starting to resemble Mikitty. What do you think about Mikitty? She's a dai-senpai, and I think she's a pretty person. I've been told at handshakes that I resemble her. Q42. Nuntun has made his magazine debut. If Happy could appear in a photo book, what sort of photo book would you make? I talked about this just now. I'd actually like to just take photos of Happy in clothes. Nishiguchi: Would you take photos of Happy while in a bathing suit? I'll wear a swimsuit if Nishiguchi-san wears one as well. Q43. With Miyazaki Yuka-san as the oneechan, how would you represent the other Juice=Juice members in a family? Karin: A bit older, an oneechan who's a year older. Because she's knowledgeable about beauty. Sayuki: Younger sister. A bit mischievous. Tomoko: Cat. There are times when she gets excited and can be quite the pain. But there are times when she's settled and whimsical. Q44. What breed of dog would you raise if you were raising a dog? Nishiguchi: This is the same question, right? A cavalier cocker spaniel, or a Labrador retriever. Nishiguchi: Isn't this turning out to be more like 'anything goes'!? Hajimete no Keikenchuu's music video. It's the first time we've had acting elements, and in the middle of the song, the members change positions swiftly. Q.46 What would you like to do for your Budokan concert. Coincidentally, I was thinking that on my way here today, so it's quite the surprise that this question came up. I'd like to take a selfie with a sea of green glowsticks as a background. For commemoration. Q47. What would you like to do in the 2 months left in this year? Nishiguchi: I saw on the news that dressing up as a devil is quite popular. It seems that Miyazaki-san's Halloween photos have been selling well. How sly of her. Q48. Would you prefer to be called pretty or cute? I'd be glad with either, but with my current mood, it'd be 'cute'. Q49. How do you think things would have turned out if you had entered Morning Musume。? I've never thought about joining Morning Musume。But with Sayashi-san around, I'd be nervous and flustered every day, Also, I'd undoubtedly have fights with Sato Masaki-san! Q50. If you could produce the H!P shop, how would you arrange it? I'd line up lots of outfits, this area (the whole event space) would all be Juice=Juice, the other groups would be here and there. Nishiguchi: Are you doing well physically? Nishiguchi: Well then, please give a show of enthusiasm for your future activities. We attained a 1st place Oricon ranking and have had our own tour, so we've experienced so many things this year, but receiving an opportunity to do a drama is pretty rare, so I think that it's fate that Juice=Juice was selected for it. I'd like to act and do work that makes me grateful for being in Juice=Juice. 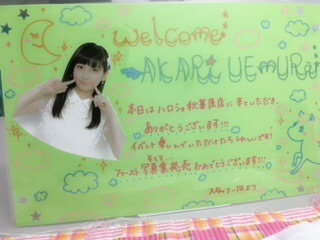 There's also the second part of the event, where Aarii talked about off-shots from her PB. As a whole, the event wrapped up at 8. Sayashi then dropped her graduation announcement at ten. Aarii's blog post, less than an hour after that, was a bit mixed - she'd just recovered from tonsillitis, did two promotions of her new photo book, and her favourite member had just announced her graduation. Poor dear. I couldn't make head nor tail of the question, so I decided to just give up and skip it.